*** Prologue: Don't I hate it when this happens, although its only the second time (I think) that it has happened. Yesterday evening I wrote and published a brief blog post and at some point since, I apparently overwrote it with an earlier word-free draft while using my stupidphone as a flash light. (Have I ever mentioned how much I hate the useless piece of C^&% Samsung phone that I was talked into as a replacement for my wonderful but aging Motorolla?) Anyway, its camera is the one redeeming feature and I had used it to upload the pictures directly to an empty post to see if that helped with the picture quality then I closed Blogger, BUT you have to close everything twice on this phone and the draft hung there, waiting to ambush and overwrite the published post at 4 am when a sleepy victim would pick up the phone and randomly squeeze buttons trying to wake it up while trying to see what time it is...... yup it cleverly reopened the wordless draft and published it over top of the published one without so much as a howdiyahdo! So what follows is a new blog post because I don't remember exactly what I said the first time around. Its been over a month(!?!) since I last set brush to figure (which has to do with the demise of the halogen floor lamp that used to help illuminate my wargame table as much as anything else but its a boring story). My decision to reorganize my ACW regiments into 4 stand units instead of 3 is fairly easy to manage for an army of motly Airfix ACW figures except for a few special units like Cesar's Zouaves (click here for their story). 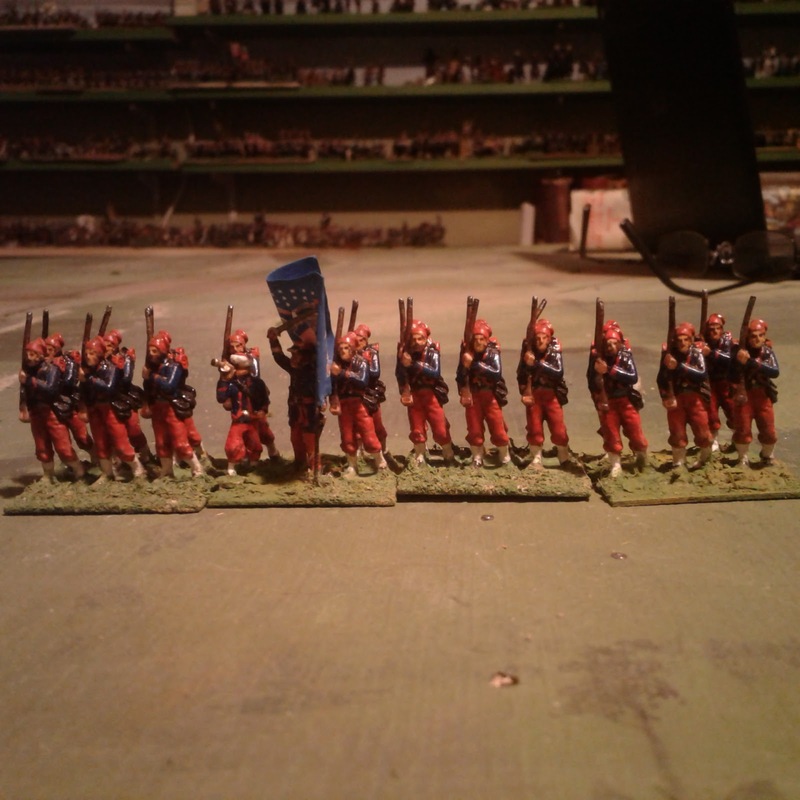 Luckily I haven't painted them all yet and I bought a Zouave command pack from Musket Miniatures last year. These latter are HO/20mm and are therefore slightly smaller, accentuated here by the drummer and bugler being apparently portrayed as boys and the Zouaves being big fellows. 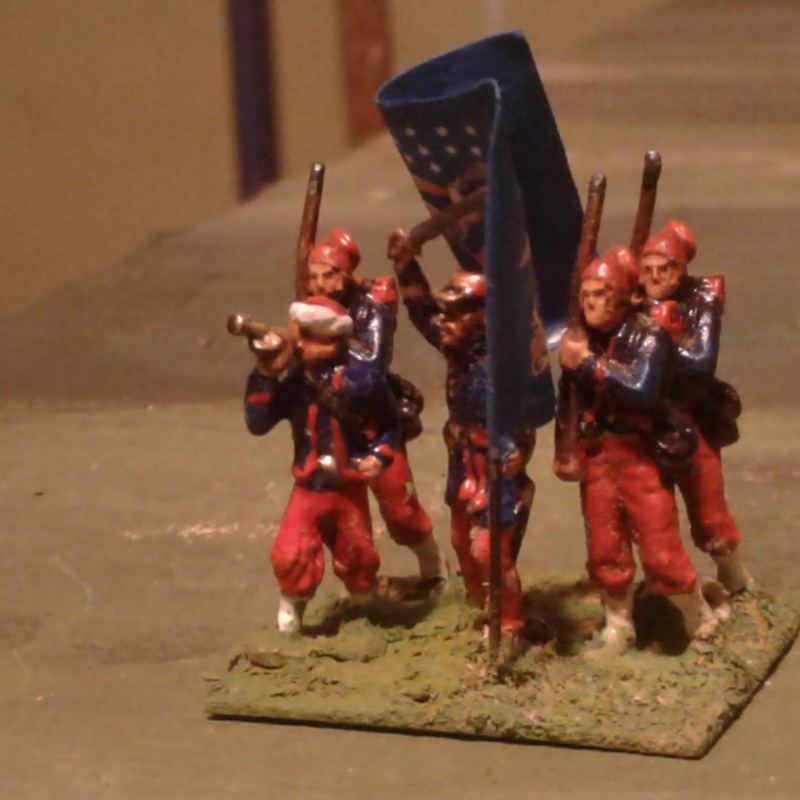 I grabbed the bugler and 3 Zouaves and saved the rest for the 2nd regiment. It was only after I had finished painting and started to base them that I remembered that I'm doing 6 to a stand, not 4. hmmm paint two more or...?? A quick head count showed that one unit or other was going to be short a figure or two so might as well be the Veterans. I just left 2 blank files. What next? Well, next free day is next week sometime and there is a group ECW game on Saturday so we'll see when we get there! A fine addition to your forces squire! There is a cavalry regiment of Irish immigrants trying to work their way onto the painting table. So, what I'm hearing is that my 1000 word comment that was illuminating, incisive and had the potential to redefine not only wargaming but life as we know it, is gone. This is why we can't have nice things people. It's all Ross's fault! That is odd. Computers are such a mystery, aren't they? Well,.... not really :). The post was never removed or deleted, only the contents were updated with an earlier version accidentally by my 5th Column phone and then updated again intentionally by me. As far as blogger and the internet goes, its all the same post. Very inventive solution, the bugler "boy"--very good look. 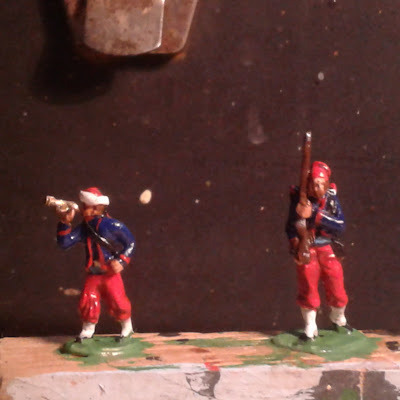 Had you not pointed out that there were two blank files in the unit, I would not have noticed: snappy looking zouves! (perhaps a redundant phrase). Thanks, an old trick for me, often short of a few somethings. The bugler boy is a very nice figure and the unit look wonderful with him. Actually the unit makes him look better than he does when he's alone. If you want to have a good time Jine the Cavalry!